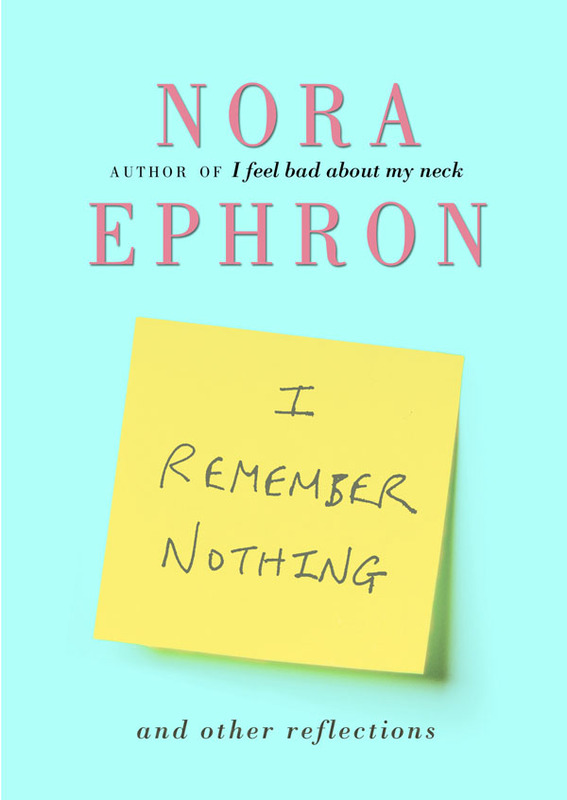 This week I read: I Remember Nothing by Nora Ephron. I love her because I occasionally see a little bit of myself in her. I love her because I sometimes want to be like her. And because if I end up like her I won’t be in any way disappointed. I love her because she is funny. Deeply, honestly, funny. And she’s clever. Seriously intelligent. And she’s lived. Really lived and enjoyed and sucked the marrow out of life. I love her because she doesn’t pretend to be something she isn’t. And because she’s wise. She’s so wise and blunt, and I love that. Her latest book, I Remember Nothing, is a collection of short articles and essays on her life and her experiences. It’s in many ways like her previous collection, I Feel Bad About My Neck, but maybe even more personal, perhaps a little more telling. It’s a book of reflections – of memories made, events attended, people met, things felt – and everything forgotten. The way Ephron writes is poignant, without being soppy. Sarcastic, without being too much so. And funny. I’ll call her that 100 times, because that is what she is. Nora Ephron is so much more than the screenplays she wrote. There’s more to her than Harry Met Sally, Sleepless in Seattle, You’ve Got Mail, Hanging Up, Julie & Julia, This Is My Life and the rest. And I think it can be found in her collections. In I Remember Nothing – where she may have forgotten the encounters with people she has met, like Eleanor Roosevelt, Cary Grant, Dorothy Parker and The Beatles – she has managed to compile, to list, to remember the things that define her; husbands, and family, New York, and travel, books, and writing, waffles, and reading, dinners, and friends…and all the little pieces in between. Nora Ephron makes me look forward to getting older. If for nothing else than because there’s still a chance to be like her. → I’m Just Not That Into Them.